This cross-sectional study aimed to explore potential jawbone changes secondary to bisphosphonate (BP) treatment of osteoporosis using digital panoramic and periapical radiography. 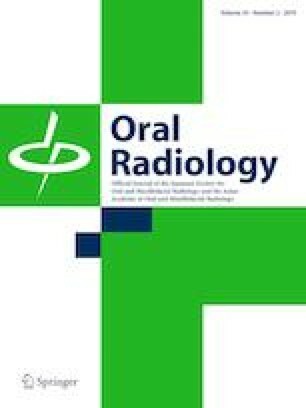 Thirty-nine women, previously examined with dual-energy X-ray absorptiometry, were radiographed by digital panoramic and/or periapical radiography. On periapical radiographs, trabecular bone structure and fractal dimension analyses of the mandibular first molar and edentulous regions were performed. On panoramic radiographs, the mandibular cortical width (MCW) was calculated, and trabecular bone structure and fractal dimension analyses of the trabecular bone in the alveolar and basal bones were performed. The results were compared between patients treated or not treated with BP using linear regression analysis to adjust for potential confounding factors. The analyses of periapical and panoramic radiological images showed no statistical differences in the jawbones between groups after bisphosphonate use for mean intervals of 4.3 and 5 years; respectively. Although the mandibular cortical width on panoramic radiography was correlated with BP use, it was not noted to be statistically significant. The trabecular parts of the alveolar and basal bones and the MCW were not significantly altered by BP treatment in patients with osteoporosis over 4.3–5 years, as detected by digital periapical and panoramic radiography. The low dosages of bisphosphonates used in the treatment of osteoporosis may explain this lack of change in MCW. Dental radiographs should not be considered as a method to monitor BP-induced jaw bone alterations among osteoporotic patients. This study was part of the OSTEOSYR project, a fully funded MSc and PhD project by the Faculty of Dentistry, Damascus University, Syria. Imad Barngkgei was the principal investigator. Imad Barngkgei, Esam Halboub, and Abeer Almashraqi declare that they have no conflict of interest. All procedures followed were in accordance with the ethical standards of the responsible committee on human experimentation (institutional and national) and with the Helsinki Declaration of 1975, as revised in 2008 (5). Informed consent was obtained from all patients for being included in the study. All procedures followed were in accordance with the ethical standards of the responsible committee on human experimentation (institutional and national) and with the Helsinki Declaration of 1964 and later versions. Informed consent was obtained from all patients for being included in the study.